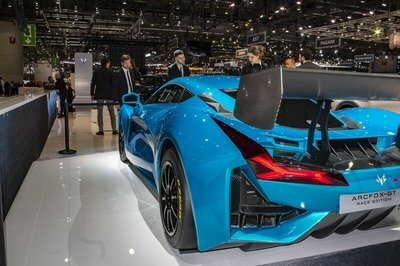 The Chinese BAIC Group in cooperation with BJEV (Beijing Electric Vehicle) is trying to branch into the EV supercar world with the Arcfox sub-brand that was present at the 2019 Geneva Auto Show. The brand showcased three cars, the flashiest of which was, undoubtedly, the Arcfox-GT Race Edition. It’s a track-focused version of the Arcfox-GT that puts out 1,600 horsepower and 973 pound-feet of torque, features GT3-esque aerodynamics, and relies on state-of-the-art tech solutions straight from Formula E championship. The state-owned BAIC Group is quite the colossus in China. Besides making cars under its own name and under the Senova, Foton, and Changhe brands, it also produces Beijing Hyundai and Beijing Benz vehicles through joint-venture deals. It’s among the five largest Chinese automakers and, now, over 30 years since it was founded, BAIC and BJEV have come together to launch a luxury sub-brand called Arcfox that brought to Geneva two supercars and one SUV – all three fully electric. The Arcfox-GT and the GT Race Edition were the attention grabbers at the Arcfox stand, and we’re going to talk about the latter of the two here.